We love coconut! It’s no wonder this tropical superfood is found on desert islands—it’s sun-grown complete nourishment packed with fiber, healthy fats, protein, electrolytes, minerals, and medium chain triglycerides (MCTs). An original Living Fuel product, CocoChia® Snack Mix is a delicious mix of three of nature’s powerful superfoods, raw organic shredded coconut, whole raw chia seeds, and lightly sweetened with our very own TheraSweet™. CocoChia Snack Mix is wonderfully versatile—enjoy CocoChia in oatmeal, yogurt, in your favorite salads, mixed into your favorite LivingFuel SuperSmoothie, or straight out of the packet! Here’s an easy and fun to prepare dairy-free, soy-free, gluten-free, all-natural snack recipe with CocoChia Snack Mix your family is sure to love! 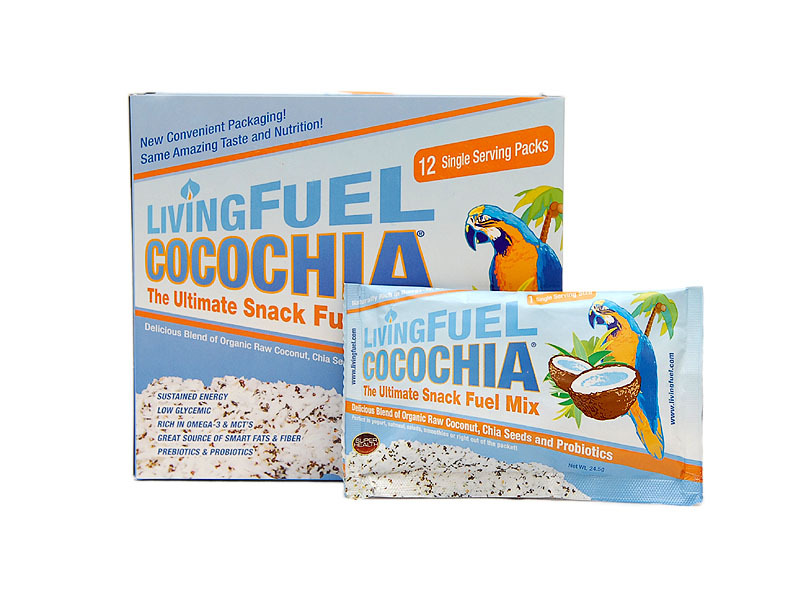 Living Fuel Founders KC and Monica Craichy answer three of the top questions on CocoChia® Snack Mix, the ultimate snack fuel. Crafted from two of earth’s most powerful and nutritious superfoods, raw coconut and raw chia seeds, CocoChia Snack Mix is the perfect gluten-free, milk-free, soy-free and hassle-free snack for the entire family. Click on the graphic below to watch. Living Fuel Founders KC and Monica Craichy answer three of the top questions on CocoChia® Snack Mix, the ultimate snack fuel. Crafted from two of earth’s most powerful and nutritious superfoods, raw coconut and raw chia seeds, CocoChia Snack Mix is the perfect gluten-free, milk-free, soy-free, and hassle-free snack for the entire family. Click on the graphic below to watch. We love coconut! It’s no wonder this tropical superfood is found on desert islands—it’s sun-grown complete nourishment packed with fiber, healthy fats, protein, electrolytes, minerals, and medium chain triglycerides (MCTs). An original Living Fuel product, CocoChia® Snack Mix is a delicious mix of raw organic shredded coconut, whole raw chia seeds, and lightly sweetened with our very own TheraSweet™. CocoChia Snack Mix is wonderfully versatile—enjoy CocoChia in oatmeal, yogurt, in your favorite salads, mixed into your favorite LivingFuel SuperSmoothie, or straight out of the packet! Here’s a great new dairy-free, soy-free, gluten-free, all-natural snack recipe with CocoChia your family is sure to love on a hot day this summer (or anytime)! Mix ingredients thoroughly in a mixing bowl. Roll batter into small, approximately one-inch diameter balls. Place in freezer-proof bag or container. For some delicious variations, add ½ smashed banana, 2 tablespoons of organic dark chocolate chips, or ¼ cup goat’s milk yogurt, or coconut milk yogurt. Adjust ingredients to taste. For added protein, fiber, and probiotics add 1 scoop of LivingFuel LivingProtein along with ¼ to ½ cup water to help mix it in the batter. Our gift to you! 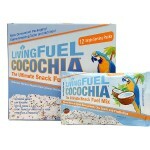 Use the limited-time promotion code summer at checkout and receive one complimentary box of 12 single serving packets of CocoChia Snack Mix (a $17.97 value) with any order at www.livingfuel.com. Offer good today through July 4, 2011 or while supplies last. Coming this Thursday on LivingFuelTV, we continue our special series Super Human Feat with the amazing Christian Isakson. If you missed last week’s interview introducing Christian and his remarkable accomplishment this month in Hawaii, click on the graphic to the right.